Patient 3D reconstruction based on high-resolution Computed Tomography scans: cut-out showing the location (in red) of the tumoral mass. Three-slice projections of the dose map delivered to the patient. Charged particle cancer therapy based on intensity modulated pencil beams is an effective cure for localised tumours that cannot be treated surgically with standard techniques because patient anatomy prevents surgery, or because the tumours are too close to critical organs, or they are highly radio-resistant. The approach consists in delivering the prescribed dose throughout the target volume by superposition of many thousands of individually weighted pencil beams. The main advantage of the technique resides in the capability of delivering a highly-conformal dose distribution to arbitrarily shaped tumours. The success of particle therapy is based on the accurate modelling of physical and biological dose released in human tissues. The advent of general-purpose programmable GPUs has prompted the development of MC tools that can deliver a plan calculation within minutes . The new hardware requires to substantially rewrite the core kernels of a MC calculation adopting the parallel execution model of a typical GPU. In the last three years a fast-MC tool called Fred has been developed at University of Rome "La Sapienza". 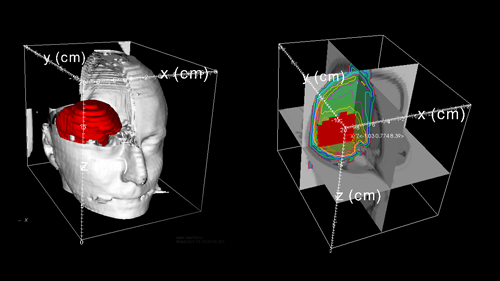 The code can track proton pencil beams through a voxel 3D patient reconstruction grid based on high resolution CT scans. The kernel implements energy loss based on tabulated stopping power . Different models (single Gaussian, double Gaussian, Gauss-Rutherford) can be used to reproduce Multiple Coulomb Scattering. Secondary protons and deuterons are produced in the beam nuclear interaction following the multiplicity, energy and angular distributions provided by ICRU63 , and interpolated for other materials. The voxel HU of the CT is converted in elemental composition following the method by Schneider. Alpha and heavier fragments produced are treated as local dose deposition and (in this version) neutral particles are not produced. The dose matrix can be processed by an optimizer based on a least-squares optimization algorithm as in . The output/input system has been adapted to the CNAO environment. All these solutions have been checked for efficacy and accuracy against a full-MC code, and the resulting kernel can deliver more than 1 million complete histories per second on a single GPU. The achieved tracking rate allows to perform a typical plan recalculation within minutes.